These are the nominees for 2014, along with a brief excerpt from the comments by the nominator. Shannon Barnett, trombone, “…one of Australia’s finest Jazz musicians. She is an inspiration to so many, around the world, and is someone who is highly regarded in the scene, as a wonderful trombonist and improviser… she is now based in Cologne and has a position with the WDR Big Band – arguably one of, if not the best big band, in the world today.” Nominated by Kristin Berardi. 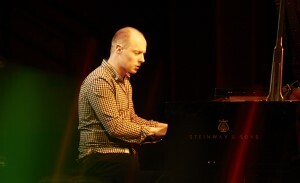 Aaron Choulai, piano. “…he is an extremely talented pianist, composer and improviser. He has led many ensembles in Australia, USA and Japan and deserves support as a creative artist.” Nominated by Andrea Keller. Karl Dunnicliff, bass. “…he is a beautiful and sensitive double bass player.” Nominated by Joseph Tawadros. Tim Firth, drums. “…I feel he is one of Australia’s finest jazz musicians, and is very deserving of this honour. He has been and is a part of many people’s own projects… He is a skilled and encouraging educator and mentor to many as well.” Nominated by Kristin Berardi. Zoë Frater, bass. “She is a highly gifted player, a wonderful improviser and writes truly original music…Zoë has contributed to the jazz community in Melbourne as a volunteer for the Jazz-Co op…” Nominated by Jessica Green. Callum G’Froerer, trumpet. “His journey as a performer has led him through jazz, classical, contemporary classical, new music and improvisation. His skills on his instrument are outstanding and his pursuit of excellence in all fields of music is inspirational.” Nominated by Mace Francis. John Hunt, reeds (clarinet, bass clarinet, sax), “…I have been impressed with John’s sound and his deep understanding of the tradition of his instrument.” Nominated by Stephen Magnusson. Ben Marston, trumpet. “Ben is constantly seeking to find new composition and improvisation directions enabling jazz music to be infused with a large range of influences from classical, rock, world, hip-hop, electronica, pop, and culturally-specific idioms.” Nominated by Dean Ellis. Lucian McGuiness, trombone. “…Lucian’s ongoing dedication to creating new performing opportunities in Sydney and Australia, both for himself, and for many other local jazz musicians. This includes hundreds of hours of volunteer work for organisations such as Jazzgroove…” Nominated by Jessica Green. Jarrad Payne, drums. “…one of the most inventive musicians Adelaide has produced. Since leaving university he has written for and led many ambitious ensembles, most notably 1.1 Immermann and voicerom, and has developed an idiosyncratic drumming style which is highly inventive and sophisticated.” Nominated by Lydon Gray/COMA. Julius Schwing. “…he has the quintessential attributes of a good jazzman. These are: solid understanding of jazz history, compositional identity, technical grasp of his instrument (guitar), unique individual sound, good tone acoustic and electric, and affinity for swing and blues feelings, spontaneity and fun attitude.” Nominated by Brian Ritchie. Matthew Sheens, piano. “…a brilliant pianist currently living in New York where he completed his tertiary study and has recorded two albums. 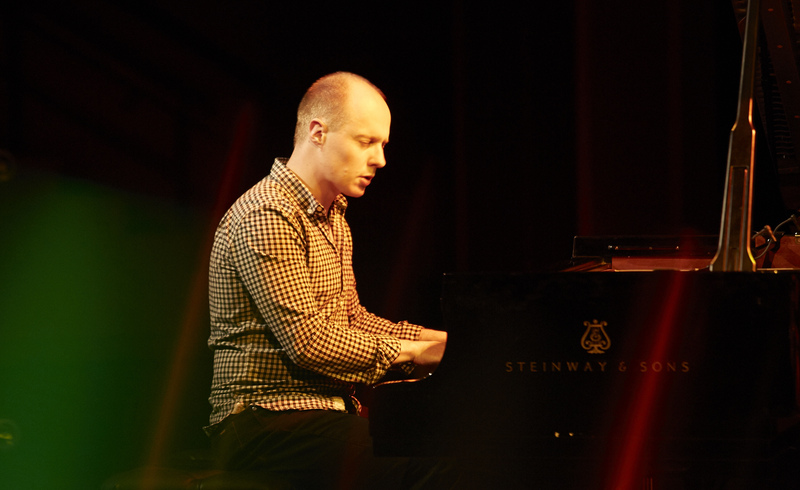 He has been the recipient of several Australian awards to date including the APRA/ AMCOS Professional Development Award for Jazz composition and the Dame Ruby Litchfield Scholarship…” Nominated by Lydon Gray/COMA. Alex Silver, trombone. “A great trombonist in the Sydney scene, she has her own quartet and have been impressed by her musicianship on many occasions as a ‘side-woman’ and soloist.” Nominated by Joseph Tawadros. Gian Slater, voice. “…she has made an incredible contribution to Australian creative music in her career so far. She continually produces music which is of the highest quality, is very unique, original and pushes the boundaries.” Nominated by Andrea Keller. Daniel Susnjar, drums. “He is one of the most committed, enthusiastic and talented musicians that I have come across. He has a vast knowledge of jazz and Latin styles, especially afro-Peruvian rhythms which he studied for his Doctorate at the University of Miami… He is a driving force in the Perth jazz scene and deserves a more national profile.” Nominated by Mace Francis. Joe Talia, drums/percussion. “…Joe has found an original voice on the drum kit whilst developing his skills as a fantastic team player. he has played in so many diverse projects from the Andrea Keller Quartet to the wall of sound ensemble Magic mountain band.” Nominated by Stephen Magnusson. Kristin Berardi, QLD. Vocalist, won the Montreux Jazz Festival, a Bell Award, and Wangaratta. Lectures at Queensland Conservatorium. A Freedman Fellow. Dean Ellis, ACT. Producer, The Street Theatre at ANU, including its Capital Jazz Project, a ten-day festival. Mace Francis, WA. Founder, leader of Mace Francis Orchestra, 14-piece ensemble. Has worked and composed for large jazz ensembles internationally. Artistic Director of WA Youth Jazz Orchestra. Lydon Gray, SA. Bass player. Represents COMA (Creative Original Music Adelaide), an organisation supporting original music. Jessica Green, NSW. Guitarist, jazz ensemble leader, winner of Jann Rutherford Award. Andrea Keller, VIC. Pianist, jazz ensemble leader, composer, ARIA and Bell Awards, Inaugural Freedman Jazz Fellow. Stephen Magnusson, VIC. Nationally and internationally distinguished guitarist, ARIA winner. Brian Ritchie, TAS. Founding bassist, multi-instrumentalist of American Indie band, Violent Femmes, and Australian surf band Break. Music Curator of Museum of Old and New Art (MONA, Hobart). Joseph Tawadros, NSW. International oud virtuoso, Freedman Fellow. JAZZ JUDGES. The judges for 2014 are Paris-based Australian pianist Chris Cody, drummer Andrew Gander and Freedman Fellow, trumpet player Phil Slater.